Enable users to quickly and easily connect to VMware Horizon View (VMware VDI) desktops directly from any HTML5 compatible browser on any platform. This includes from Windows, Mac, Linux, iPad / iPhone, Google Chromebook, Android, RIM BlackBerry / Playbook, Amazon Kindle Fire HD - even locked-down Workstations - without having to download, install or configure any software on the end-point device. Now supports Windows 8 and Windows Server 2008. 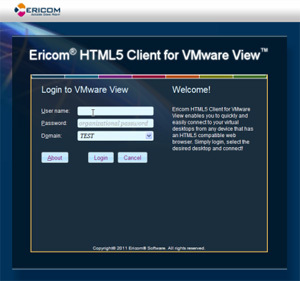 Why Ericom AccessNow for VMware Horizon View? Empowers users with secure access to their virtual desktops from any device that has an HTML5-compatible browser (e.g., Windows, Mac, Linux, iPad/iPhone, Android, Google Chromebooks and RIM Playbook). Supports integration with RSA® SecurID® and SecurEnvoy® SecureAccess and SecurICE two-factor authentication, as well as leading SSL VPNs. Runs wholly within the browser - that means there's no client software to download or manage. Enables Educational, Governmental, Healthcare, Financial, Manufacturing and other organizations to unify access to computing resources. Supports the widest variety of end-user devices - key drivers in the growing trends toward workshifting (telework) and BYOD / BYOC. Integrates with Homegrown portals and Enterprise portals. Enables mission-critical business continuity by allowing employees to access their applications and desktops from any available end-point device, anywhere, without having to install any software or plugins. VM-Hosted Applications Tech Preview - Allows for the deployment of Windows applications using VMware View VDI desktops as the hosting platform. This provides large groups of task-based users with browser-based access to one or more applications without requiring the use of the entire virtual desktop.